David Drábek (1970) is an author and director in one, with a lushly developed fantasy vision. His heroes are getting older with him. There is obvious the deformation of reality according to the subjective view of heroes and their efforts to solve the crisis of young and middle age. He shows the hopes and disappointment belonging to different ages and to various social categories. His style is characterized by grotesque hyperbole, references to pop-culture and personal and general history. David Drábek (1970). The playwright and stage director, David Drábek, graduated from film and theatre studies at the Philosophical Faculty of Palacky University in Olomouc. During his university studies he founded (together with Darek Král) the Hořící žifara (Burning Giraffe) theatre studio that specialized in the genre of modern cabaret. From 1996 to 2001 he worked as a playwright at the Moravian Theatre in Olomouc. Between 2001 – 2003, he was in charge of the newly created alternative stage, Hořící dům (Burning House). In 1995 he received the Alfréd Radok Foundation Award for the Best Play of the Year for the text of Jana from the Park and in 2003 he received the same award for the text Aquabelles that later won the 2005 Best Czech Play of the Year Award. His play The Coast of Bohemia Square that ranked second in the 2007 Alfréd Radok Awards play competition and became the Czech Play of the Year in the 2009 Alfréd Radok Awards. Chocolate House became the 2011 Czech Play of the Year. In 2003, Větrné mlýny published a collection of seven of his plays, in 2011 Kosmas Publishing House released a set of ten newest author’s plays entitled To Shake the Czech Pork Jowl. David Drábek is one of the most cited and transcribed playwrights, as a stage director, he is one of the creators with an unmistakable imagination. 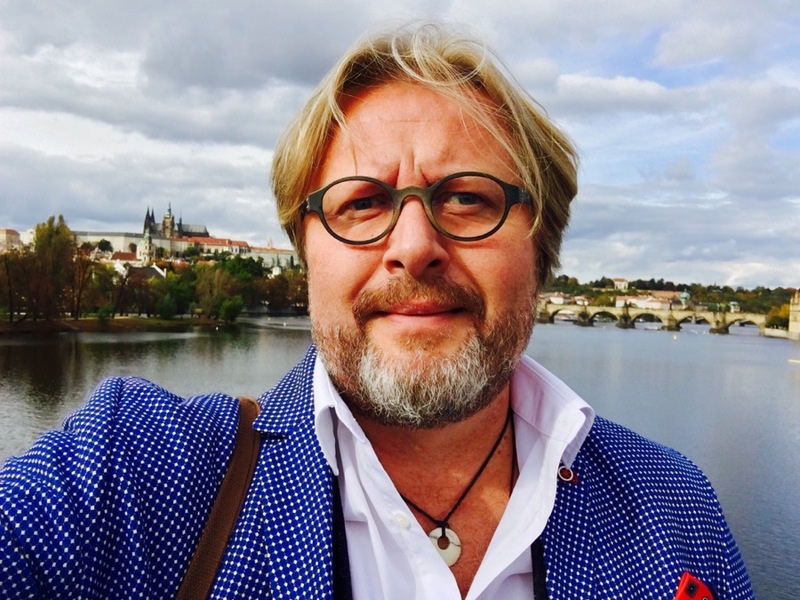 As an author, stage director and playwright, he worked with a number of Czech theatres, including the National Theatre and the Vinohrady Theatre and in 2005-2007 he was the full-time director of the Minor Theatre. From 2009 to June 2017 he was the artistic director of the Klicpera Theatre in Hradec Králové. Together with Daniel Přibyl and Michal Dočekal, he won a tender for the management of the Municipal Theatres of Prague (from 2018). Alfréd Radok Award for the best original play of 2003. A view of the contemporary generation of thirty-somethings. Three university friends conceive a secret hobby: they meet at a hidden reservoir and ”dance“ in the water. Their furry legs are vibrating in the rhythm of music above the surface, and they experience the moment of harmony and coordination that these thirty-something adults do not experience on the ground. With party picnics after training, they just mask the cracks in their relationships. After school their paths had diverged. Kajetán had taken the post of TV moderator and became a true celebrity. He oscillate between the models’ arms and the arms of his English teacher. Petr stayed at the university as a lecturer and continued his stubborn struggle against consumerism. He pedantically watches his wife and son in front of the traps of civilization and exposes Kajetán to betrayal of ideals. However, the two friends are caught off guard by Filip. He decides to stay in the reservoir forever, returning to an existence as a prehistoric water element. He feels like a beast, webs grow between his fingers. Gradually, he closes himself to the world until all is quiet. Things take off – Petr leaves his wife, Kajetán, influenced by the loss of his friend, causes a brawl in the TV studio. Over a few seconds their certainty has crumbled to dust. In the final scene on the shore of the lake, Peter and Kajetán carry a wooden chest on their shoulders. The dark suits are open, stones fly away from their heels. They slip Philip into the waters of the lake. Peter saves insects from the surface, and Kajetán opens a “shop” with sticks, mud and leaves. At the end, two orphaned “aqua-belles” dance for their lost friend. In spite of all its gags and humorous situations, the play is permeated with the nostalgia of a generation and in places even a frosty surreal quality. In the 2004/2005 season, the leading Czech stage director, Vladimir Morávek, staged the Aquabelles. The play won the 2003 Alfred Radok Award and later the Best Czech Play of the Year (2005). The play is also available in English, German, Polish, Spanish, Russian, Romanian, Croatian and Slovenian translations. The protagonists of this play are stuck in the stagnating water of their trivial and absurd existence. Even death cannot save them from it, however attractive it may appear. Vendelin, on an incapacity benefit pension, has had no success either as a lover, a husband, a father or a grandfather; he’s also unsuccessful as a ticket controller on thePraguepublic transport system. Even the reason for his disability is embarrassing. Rita, a Jehovah’s Witness is lonely and not entirely normal, similar to Jeronym, the homeless seller of the Czech equivalent to the Big Issue magazine. Zapik the pop-singer, with his fake English and open-necked shirt is a sad remnant of the period of Communist normalization. None of the other characters had had any luck nor are their lives dignified. The fragments of their fates intersect in the first part of the play, with the title Czech Grief, at a fancy dress party: the heroes come here in bizarre costumes representing animals and plants, embarrassingly comic scenes intercut with fantasy appearances of the Swan Woman, representing Death; Vendelin tries in vain to finally lie down in her arms. The second half, called CzechSeaside, begins as an almost realistic situation set in a hijacked tramway in which an unknown terrorist keeps the passengers as hostages. Step by step we find out that all the people on the tram are somehow connected to Vendelin – they are lovers and friends from his past. Even the terrorist demanding to be taken to the MašinBrothers Square, where he claims the Czech seaside is located, is Vendelin’s son Hynek. But Vendelin will not die a heroic death in an exploding tramway, nor will he live to be kissed by the Swan Woman: awaiting him is waking up at an Intensive Care Unit, his wife Petra, festering stagnating water and immobility. Alfréd Radok Award for the Best Czech staged play of 2009. Second prize in the Alfréd Radok Foundation’s Award for best Czech play 2007.